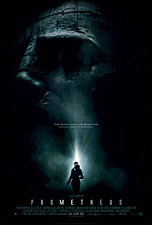 It’s hard to believe that one of many people’s most anticipated movies of 2012, director Ridley Scott’s Prometheus, is only three months away, but ComingSoon.net now has gotten word that 20th Century Fox plans on teaming with the IMAX Corporation to release Scott’s very first movie in IMAX theaters. It makes some sense because currently, there are no movies scheduled for an IMAX release in June and there are now enough digital IMAX theaters that multiple movies can be released in that format at any given time, which may happen if DreamWorks Animation goes with that format for their upcoming Madagascar 3: Europe’s Most Wanted. IMAX Corporation and Twentieth Century Fox today announced that Prometheus, the summers scariest action event picture and director Ridley Scotts return to the genre he helped define, will be digitally re-mastered into the immersive IMAX® 3D format and released in IMAX® digital and film theatres domestically and in a select number of IMAX theatres internationally, starting June 8, 2012.